If you’re looking for information about Michelina’s®, Michelina’s Lean Gourmet® or Zap’ems® meals, the answers you seek might be right here. We invite you to scan the frequently asked questions listed below. If you don’t find what you’re looking for, we’ve provided a contact form at the bottom of the page. Is it safe to heat and eat my Michelina’s®, Michelina’s Lean Gourmet® or Zap’ems® entree once it is thawed? Stay on the safe side and toss out any frozen meal that has completely thawed. Quality and food safety might be compromised, depending on the time and temperature of the thawing process. Fortunately, it’s easy to grab another frozen entree, heat it up and enjoy! Do you offer family-sized Michelina’s®, Michelina’s Lean Gourmet® or Zap’ems® entrees? We offer our entrees in convenient single-serve sizes, so everyone can choose their favorite. Enjoy with your family or on your own! Where can I find Michelina’s®, Michelina’s Lean Gourmet® or Zap’ems® frozen entrees? Our products are found at retailers across the country. To find one near you, visit our Product Locator on the home page. Can I recycle or reuse my Michelina’s®, Michelina’s Lean Gourmet® or Zap’ems® frozen entree packaging? Because of the PET coating on our lids and trays, not all recycling centers can accept them. We do not recommend that the tray be reused or reheated. It was not designed for multiple uses. For more information about what can and can’t be recycled in your area, contact your local public works department. Help! I followed the cooking instructions and my frozen entree is still a little too cold. Do you have any gluten-free Michelina’s®, Michelina’s Lean Gourmet® or Zap’ems® products? We do not claim that any of our Michelina’s products are “gluten free”. 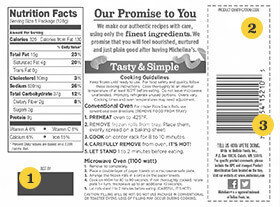 Will I find MSG in my Michelina’s®, Michelina’s Lean Gourmet® or Zap’ems® meal? Some of our meals do contain MSG, monosodium glutamate, which will be declared in the ingredient statement on the product label. What type of enzymes are in Michelina’s®, Michelina’s Lean Gourmet® or Zap’ems® products? Enzymes in food – such as cheese – can be used to help production processes, or improve texture and appearance. Cheese labels don’t have to distinguish between enzyme sources, but some enzymes are animal-based, some are vegetable-based, and some come from microbial systems. Do Michelina’s®, Michelina’s Lean Gourmet® or Zap’ems® entrees share coupons? Yes! We offer various coupons throughout the year. Keep an eye out for coupons in local flyers, and look for special sales or promotions at your local grocery store. Also, check out our website for online coupons. Mama Michelina is the inspiration behind our delicious recipes. She was a talented cook who brought Italian classics to America, and gave them fresh, local flavor. She was also the beloved mother of our founder, Jeno F. Paulucci, who created Michelina’s® to honor her and share her cooking with the world. Simply fill out the contact form, and we will respond to your inquiry.